EMAXplus™ will provide “switch fuel tank” announcements in 5 (SR20) or 8 (SR22) gallon increments. This can be reset at any time. As a pilot controllable option fuel switch audio can be configured for “immediate” or “tone only” announcements and can be fully disabled. For TKS ice protection equipped SR22 EMAXplus™ will monitor TKS fluid consumption by adding the times in which the pump has been activated in NORMAL and MAX modes. The system will announce every 15 minutes of „NORMAL equivalent“ pump use. After the TKS pump has been activates at least once this aggregated time is available on pilot request. 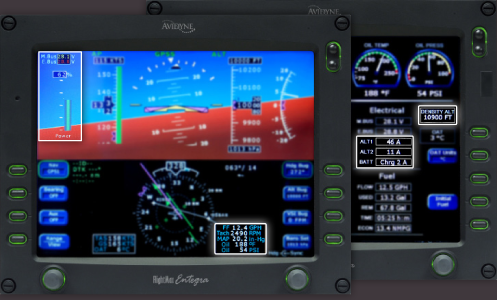 EMAXplus™ monitors OAT and pitot heat activation. „PITOT CAUTION“ is signaled if OAT drops to 5°C or below while PITOT heat is off. EMAXplus™ also provides a reminder if OAT rises above 8°C while pitot heat is on. EMAXplus™ provides a flight time stopwatch starting (and resetting) when first exceeding 2500 RPM (during takeoff). It stops when RPM falls below 1200 RPM. The pilot can request announcement of aggregated flight time.